1979. Originally operating as Kwik-Kopy Printing #409, which was an international franchise based in Houston, Texas, the center fulfilled their 25 year franchise agreement in 2004 and have operated as R & J Bardon Printing and Graphics, Inc. since then. The original owners Roger and Jean Bardon retired form the company in 1991 with ownership turned over to Les and Chris Swearingen (son-in-law and daughter), who have been with the company since 1979. R & J Bardon Printing and Graphics, Inc. has been located in the same building (Larwell Center) since opening their doors to business in 1979, having expanded twice over the years and now operate their business at 4676 Larwell Drive, which is in Northwest Columbus near Reed and Henderson Roads. 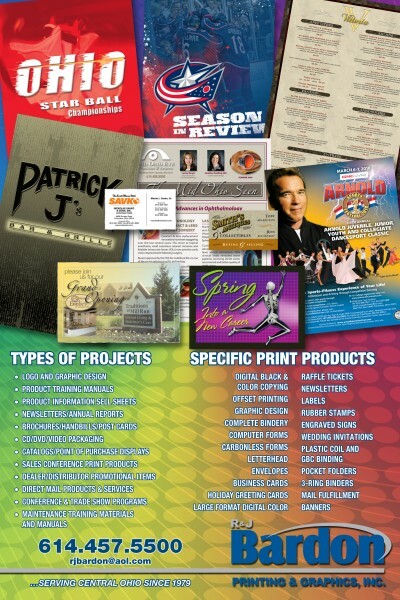 R & J Bardon Printing and Graphics, Inc. is a full service printing company that believes in providing extraordinary customer service and workmanship through a knowledgeable and dependable staff, with all employees having 16-33 years of experience with the company. Our company’s capabilities allow us to be a “one stop” shop for all of our clients design, printing, bindery and mailing needs, as we have aligned ourselves with the leaders in several industries for services that we do not have in-house.